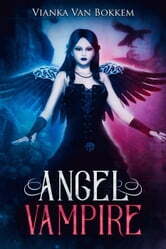 I am a female angel named 'Anael'. I was sent on a mission to Earth by my father. Finding the young boy who lived in Oxnard, California, was easy. I could hear his mother yell at him from the kitchen to finish his homework. I watched him through his bedroom window, sitting at his desk looking at a magazine, the homework all but forgotten. I wanted to watch him before I decided to show myself. All of a sudden I felt a sharp pain in my neck. I immediately fainted. I don't know how long I was unconscious. When I finally opened my eyes, I found myself in a strange dark cave. When I was about to get up, I heard an unfamiliar voice. "Who are you? Your blood tasted different than a human's, and it's making me dizzy." The stranger was an attractive vampire named 'Kendrick' who thought I was a human girl. The mixing of our blood created a new race of Angel Vampires!